MEXICO CITY -- The hurricane-battered islands of the Caribbean are facing yet another storm threat: Forecasters said Sunday that Tropical Storm Maria is likely to hit the Leeward Islands as a strengthening hurricane on Tuesday. Hurricane watches were in effect for many of the very islands still trying to cope with the devastation left by Hurricane Irma, including St. Martin, St. Barts and Antigua and Barbuda. 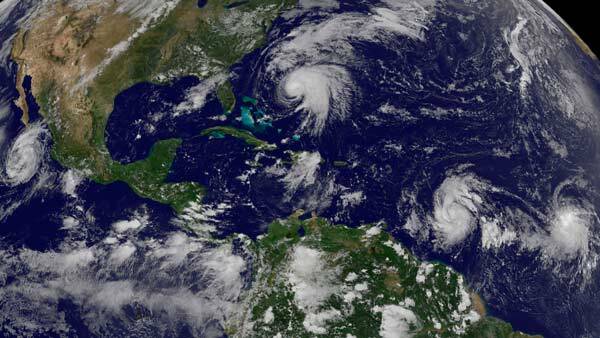 The U.S. National Hurricane Center said Maria was likely to grow into a hurricane on Sunday and swell into major hurricane status by midweek as it heads for Puerto Rico, the Dominican Republic and Haiti. The storm had maximum sustained winds of 65 mph (100 kph) late Sunday morning. It was centered about 450 miles (720 kilometers) east-southwest of the Lesser Antilles and was heading west-northwest at 15 mph (24 kph). Meanwhile, long-lived Hurricane Jose was moving northward off the U.S. Atlantic Seaboard, kicking up dangerous surf and rip currents. But it wasn't expected to make landfall. It was centered about 355 miles (575 kilometers) south-southeast of Cape Hatteras, North Carolina, and was moving north at 9 mph (15 kph). It had maximum sustained winds of 90 mph (150 kph). In the Pacific, Tropical Storm Norma's threat to Mexico's Los Cabos area appeared to be easing. Forecasters said the storm was weakening and its center was likely to remain offshore. The storm had winds of about 45 mph (75 kph) and it was centered about 145 miles (230 kilometers) south-southwest of Cabo San Lucas. That area was hit two weeks ago by Tropical Storm Lidia, which flooded streets and homes and killed at least four people. Meanwhile, Tropical Storm Lee slipped back to tropical depression force in the Atlantic and Tropical Storm Otis was gaining force fall out in the Pacific. Neither threatened land. Jose re-strengthens into Category 1 hurricane far off the coast of N.C.